Looking for a Challenging, competitive and fast-paced environment? Look no further, Come check out Aardvark Automotive! Please check out our employment page!!! "Incredible service. Understanding and nice people work here. Ended up not getting service with them because my insurance came and picked up the water damaged car. They still were very kind and offered me a ride and everything. Highly recommend." Our ultimate goal is for you to drive a safe and reliable vehicle, no matter what you drive. Welcome to Aardvark Automotive! We’re a family-owned and operated, full-service auto repair shop located in Amarillo, TX. We’ve been providing top quality auto repair services for the community since 1980, building our reputation as a friendly, local auto repair shop skilled at solving tough mechanical, electrical, and technological issues. We try to help others whenever possible, whether it's providing food or a refurbished car for a deserving individual. One cause that is particularly close to our hearts is poverty. Poverty is a multifaceted problem, stemming from various causes such as domestic abuse, immigration, situation, and being a member of the working class. 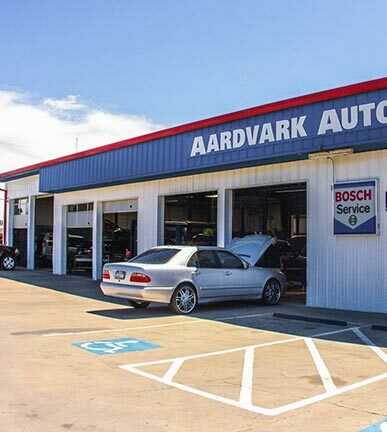 Our technicians are trained and qualified to work on all European, Asian, and American vehicles, and we are the only shop in the Amarillo area that can service high-end cars. We also service and repair Mercedes, Dodge and Freightliner Sprinter vans, and small diesel trucks. Count on us for all your vehicle repair and service needs!